You are just about to use one of the most perfumed bactericidal deodoriser ever made. This product contains a very original and authentic fragrance. Suitable for deodorising all types of carpets, rugs, mattresses, floors, chairs,curtains, etc. It can be used with a spray and bottle system, it can be used as an additive to a mopping solution, it can be used as a deodoriser with your carpet cleaning solution, it can be used in conjunction with a pressure pump to deodorise commercial floors, etc. This product can be used to deodorise natural stone floors as well. Please use the recommended dilution to avoid over deodorising and waste. This powerful bactericidal deodoriser can be used wherever where is a bad odour. Many carpet cleaning companies are using this product to deodorise carpets and sofas, many floor cleaning companies are using this powerful bactericidal deodoriser to deodorise all types of floors, many bathroom cleaning companies are using this product to get rid of bad bathroom odours, many domestic customers are using this product as a day to day air freshener and odour neutraliser. Craftex Kashmir Sapphire & Juniper Berry can be used on all washable surfaces. Try it now and we can guarantee you that you will love it. The dilution rate can vary from job to job. For daily floor or carpet deodorising jobs, you should use a dilution rate of 1 to 100. For heavy duty deodorising jobs and odour neutralising you can use a dilution rate of 1 to 20. Bear in mind that this product is not your classic deodoriser or air freshener that lasts for about 5 minutes after the initial application. This outstanding quality product has a very long lasting effect and it will keep the area deodorised for weeks. You don`t have to put up with bad odours. Craftex Kashmir Sapphire & Juniper Berry Deodoriser is here to help you out. Bad odours stand no chance in the front of this professional deodoriser. Smoke odours? Pet odours? Urine odours? Damp odours? No problem. One treatment with this professional bactericidal deodoriser and the issue will be sorted forever. 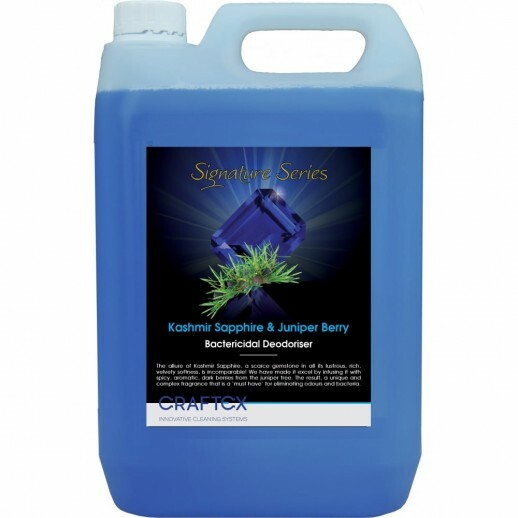 Craftex Kashmir Sapphire & Juniper Berry - this bactericidal deodoriser has no competition!